The UAE stock markets are likely to see further gains over the coming trading sessions on the back of eight main factors. The Dubai Financial Market (DFM) closed Monday’s trading session up 1.6%, while the Abu Dhabi Securities Exchange (ADX) finished the session up 1.8%. The UAE’s twin bourses have started to resume the bullish trend after facing selling pressures last week, the CEO of Al Safwa Mubasher told Mubasher. Liquidity resulted from cash dividend distributions of listed-firms is being flowed into the local stock markets ahead of the end of March to be pumped into stocks that hit low levels, Ehab Rashad highlighted. 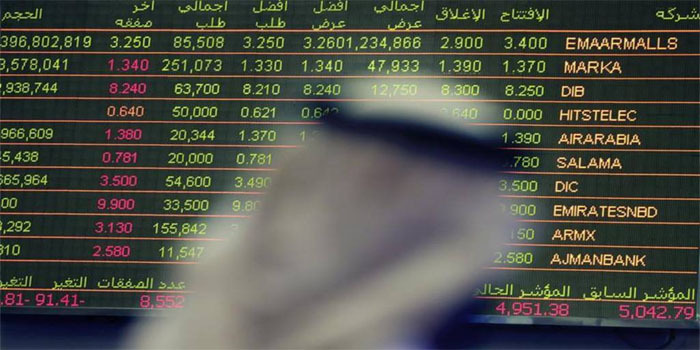 Moreover, positive reports on the performance of the emerging markets in 2019, especially after the Saudi Stock Exchange (Tadawul) joined the FTSE Russell EM index, have boosted investor confidence in the GCC markets in general, he said. For his part, Issam Kassabieh, senior financial analyst at Menacorp Financial Services, said that the UAE markets resumed the upward trend on the back of selective buying on blue-chip stocks. Kassabieh said that Dubai Islamic Bank’s stock has been attracting several traders recently, pointing out that the stock has seen losses in the past period as 2018 dividend payment was lower than 2017 distributions. Some investment portfolios started trading on stocks of firms that have not approved their 2018 cash dividends yet such as Dubai investments and Emaar Properties, he noted. Kassabieh remarked that Tadawul’s entry to the FTSE Russell EM index may push up foreign liquidity in the UAE stocks, the most profitable in the GCC region. The UAE stock markets could see further gains as its price/earnings ratio hit low levels unlike some major GCC stocks that its P/E ratio reached high levels and need correction, he stressed. The global oil prices have marked a four-month high on Monday, which will encourage investors anticipating further dividends to be announced, particularly real estate firms, CEO of Mindcraft Consulting Fady Al-Ghattis told Mubasher. Furthermore, the US stock market has snapped a four-session winning streak amid expectations to reach a final agreement regarding the US-China trade war, which will bolster the local bourses, mainly the DFM, Al-Ghattis noted.